Tickets are no longer available online. Tickets will be available at the door. Life is a journey, and if that journey takes you to France, so much the better. The Houston Chamber Ringers are known throughout the US for their dazzling precision, expressive artistry, and the whimsical sense of fun they bring to all of their performances. 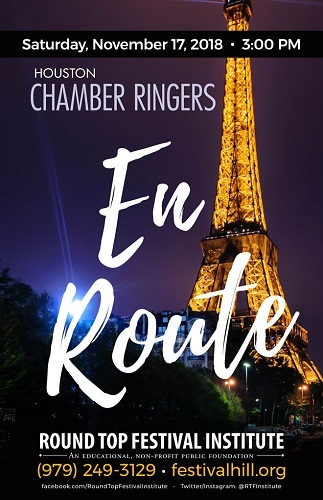 Join them "en route" for a fantastic expedition through musical destinations immortalized by Claude Debussy, Georges Bizet, and...Willie Nelson? Formed over lunch by Stevie Berryman, Sondra Tucker, and Meredith Gaines, Houston Chamber Ringers has quickly grown into a leading light in their art form. Since their first performance in December 2012, HCR has gained national recognition as one of the most innovative and entertaining handbell ensembles in the country. Performance highlights include the opening concert of "Pinnacle," a national handbell festival in 2015, and joining with Turtle Creek Chorale in Dallas for their Christmas concert series in 2017. HCR is a 17-person ensemble that performs on 6.5 octaves of handbells, 6.5 octaves of handchimes, and other assorted percussion instruments. They are honored to be sponsored by Malmark Bellcraftsmen. Adult $25. Student $10. General seating. Concert tickets will be held at the will call table on the West side of the concert hall. Doors open 1 hour prior to the concert. Tickets will also be available at the door. Lunch will be available prior to the concert at 12:45 PM in the Menke House Dining Hall, by reservation only. Purchase meals here. The buffet-style pre-concert meal has become a favorite among concertgoers. Chef's Choice Menu includes entrÃ©e, salad bar, vegetable, dessert, iced tea, coffee and water.